However, is the US not capable of hitting North Korea from wherever? So why does a rival created by the US1 cause panicked rhetoric upon achievement of an ICBM capacity ? US Senator Lindsey Graham said, “The only way they [the North Korean government] are going to change is if they believe there is a credible threat of military force on the table.” Graham believes any war will be confined to the East Asian region. 2. The US refuses a peace treaty with North Korea.3 And the sanctions against North Korea constitute an act-of-war. Trump tweeted, “China could easily solve this problem.” But it is not China maintaining a state-of-war with North Korea. 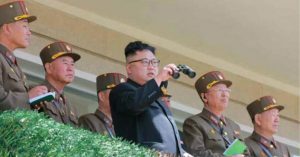 This article was posted on Thursday, August 3rd, 2017 at 11:26am and is filed under Korea, Militarism, Nukes.